Facilities - Roska DBO Inc.
Roska has its main shops and yard in north Grande Prairie, along with satellite facilities in Leduc and Fort St. John. 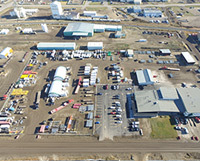 The Grande Prairie facility houses the company's field construction, safety, quality control, engineering and logistics departments. Roska manufactures its own pressure piping, with a primary focus on interconnecting equipment pieces. Please click here for a list of certifications. Roska has the industry's most complete lineup of rental pressure piping. The shop is also used to conduct inspections, maintenance and overhauls of the company's large rental equipment fleet. The shop modifies packages, such as change-outs or upgrades of metering, instrumentation and valves. Our production testing division, Roska PTS, has its own yard and shop facilities in Grande Prairie. For sourcing newly built equipment, Roska has strong relationships with approved equipment vendors, component manufacturers, pressure vessel manufacturers, and packagers. We focus on competitive procurement and achieving the customer's desired level of quality and sophistication. The facility team's mandate is to continuously improve and strive for flawless execution. That includes working to a predictable schedule, fast turnaround, excellent quality and reduced customer costs, all with top safety performance.